For the past few years, after a ski, trekking, mountain biking, or climbing trip in Patagonia, some of our clients asked if we had some kind of t-shirts or goodies to bring back home. Finally, we decided to make some souvenirs for you to remember your trip with us in Patagonia, Argentina. We have sizes for ski touring boots from 23.5 to 29.5, and backcountry ski touring gear from 1,60 to 1,88. 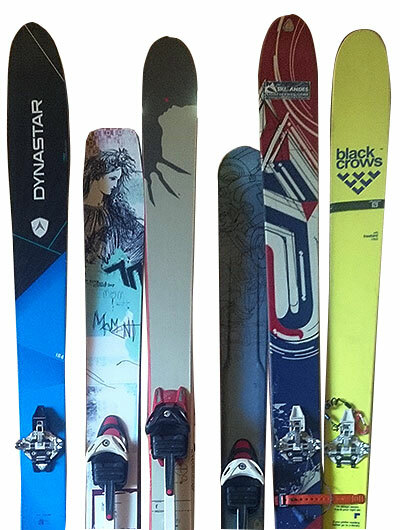 Newer models with camber and rocker Backcountry skiing gear for rent, with dynafit and Diamir Fritzchi bindings ideal for the Patagonia area. 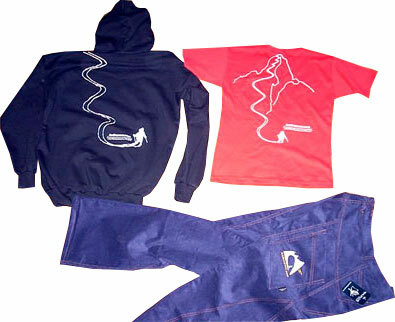 Our t-shirts and hoodies come in a variety of colors and have a original design of a skier on the back. The pants are made by a local family company here in Bariloche, Argentina, Tehuelche Patagonia, and come in a variety of colors and fabrics with the Andescross logo on the back pocket. 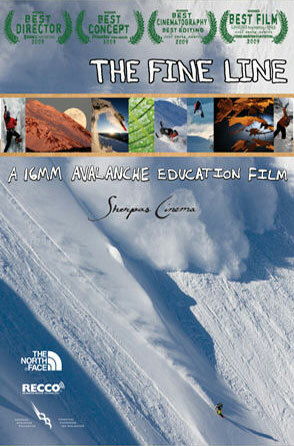 Winner of the 2013 Mountain Guidebook Award at the Banff Film and Book Festival, Canada. ABOUT THIS BOOK The dramatic Chaltén Massif in southern Patagonia, Argentina, is home to some of the most iconic peaks in the world, including Cerro Fitz Roy and Cerro Torre. The steep walls of these jagged spires range from 300 to 1500 m, and from enjoyable day climbs to unrepeated horror shows. Although this is not the faraway land it once was, the beauty of the peaks, the quality of the rock and the ferocity of the storms remain unchanged, offering climbers the timeless pursuit of real adventures and lasting memories. It covers the Cerro Fitz Roy and Cerro Torre chains, as well as Cordón Adela, Cordón Marconi, Cerro Piergiorgio and the Cerro Pollone group. 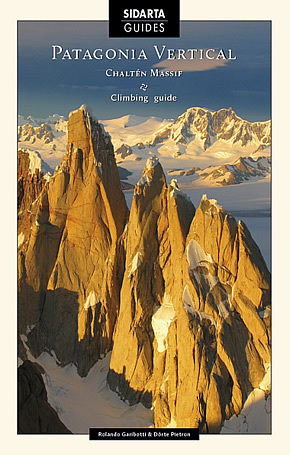 It is a complete guidebook to the area, describing every peak and climb. The text includes general information, history, approaches, route descriptions, recommended gear, strategy and descents. 368 color pages covering 250 routes in 39 peaks, including 90 topos, 120 photodiagrams (photo-topos) as well as 100 more photos. Ski Movie September of 2009, Andescross worked with the Rocky Mountains Sherpas film crew, and we had a total blast organizing logistics, guiding, helping with filming, and skiing into the Crater of Volcan Puyehue in Chile with world-class ski athletes from Salomon, Helly Hansen and 4frnt Skis: Mark Abma, Eric Hjorleifson and Chris Rubens. They shot footage to create an environmental film ALL I CAN (2011) and a tv show for Salomon Freeski TV. THE FINE LINE is available in English, French, Spanish, and Japanese. Thanks guys! 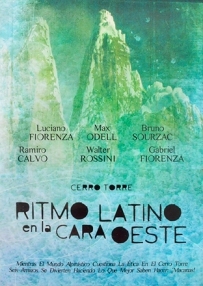 Our friend, and fellow UIAGM Guide, Ramiro Calvo, won an award in Trento, Italy (2007) for his film “Ritmo Latino en la Cara Oeste” which he filmed, directed, and produced. This movie is about six friends who repeated the route up the west face of Cerro Torre, which was originally opened in 1974 by “Ragnni di Lecco”. Ramiro is a hidden talent, and he has lots of energy lots to give. Apart from this film, Ramiro has worked hard to bring Argentina to the UIAGM standards.